Henry Patton Blythe was born in 1851. He was the son of Thomas Jefferson Blythe. Henry Patton Blythe died in 1898. William Jefferson Blythe married Lou Birchie Ayers. William Jefferson Blythe was born in 1884. He was the son of Henry Patton Blythe. William Jefferson Blythe died in 1935. William Jefferson Blythe was born in 1918. He was the son of William Jefferson Blythe and Lou Birchie Ayers. William Jefferson Blythe died in 1946. Married Name Her married name was Blythe. Lou Birchie Ayers married William Jefferson Blythe, son of Henry Patton Blythe. Samuel Dixon married Elizabeth Oldham Piddington, daughter of Mathew Michael Piddington and Elizabeth Oldham, on 20 January 1865 at Paris, Grant, Wisconsin. Samuel Dixon and Elizabeth Oldham Piddington were divorced circa 1866. Charles Rouse was the son of Charles Dixon Rouse and Elizabeth Marie Holmes. Name Variation Retta Evelyn Wills was also known as Rita. Married Name circa 1916 As of circa 1916,her married name was Hoadley. Retta Evelyn Wills was born on 20 November 1892 at Wisconsin. She was the daughter of John Wills and Grace E. (?). Retta Evelyn Wills married Guy Waterman Hoadley, son of George Waterman Hoadley and Caroline Frances Chadwick, circa 1916. Retta Evelyn Wills died on 17 April 1958 at hospital, Waukegan, Lake, Illinois, at age 65 Mrs Guy Hoadley (Retta Wills), 65, obituary. 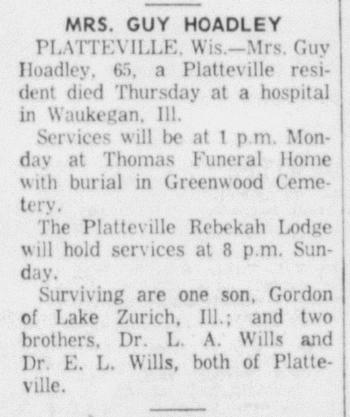 She was buried after 17 April 1958 at Greenwood Cemetery, Platteville, Grant, Wisconsin. Retta Evelyn Wills graduated in 1913 at Platteville Normal School, Platteville, Grant, Wisconsin. She was a teacher, public schools in 1920. [S243] U.S. Federal Census 1920 U.S. Federal Census, by Ancestry.com, Year: 1920;Census Place: Davenport Ward 6, Scott, Iowa; Roll T625_513; Page: 5B; Enumeration District: 175; Image: 391. [S250] U.S. Federal Census 1930 U.S. Federal Census, by Ancestry.com, Year: 1930; Census Place: Platteville, Grant, Wisconsin; Roll 2574; Page: 4A; Enumeration District: 44; Image: 655.0. Robert McCracken was born in 1727. Married Name Her married name was Rea. Ann McCracken married (?) Rea. Ann McCracken was born in 1736. She was the daughter of Robert McCracken. Ann McCracken died in 1781. (?) 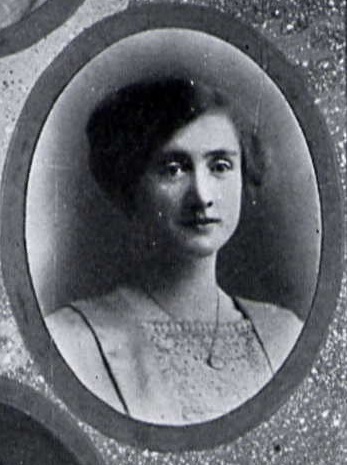 Rea married Ann McCracken, daughter of Robert McCracken. Ann Rea married (?) Scott. Ann Rea was born in 1775. She was the daughter of (?) Rea and Ann McCracken. Ann Rea died in 1852. (?) Scott married Ann Rea, daughter of (?) Rea and Ann McCracken. John Witherspoon Scott married Mary Potts Neal. John Witherspoon Scott was born in 1800. He was the son of (?) Scott and Ann Rea. John Witherspoon Scott died in 1892. Mary Potts Neal married John Witherspoon Scott, son of (?) Scott and Ann Rea. Married Name 20 October 1853 As of 20 October 1853,her married name was Harrison. Caroline Lavinia Scott was born on 1 October 1832 at Ohio. She was the daughter of John Witherspoon Scott and Mary Potts Neal. Caroline Lavinia Scott married Benjamin Harrison, son of John Scott Harrison and Elizabeth R. Irwin, on 20 October 1853 at Ohio. Caroline Lavinia Scott died on 25 October 1892 at District Of Columbia at age 60. First Lady. 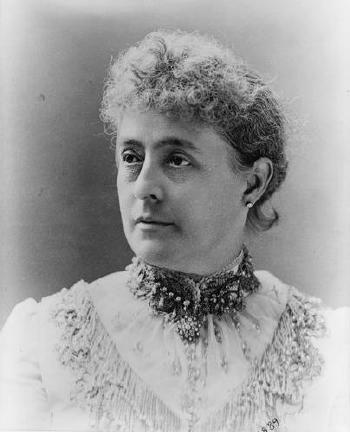 Caroline Lavinia Scott Harrison was the accomplished wife of President Benjamin Harrison. She painted, played the piano, and was an excellent hostess. Married Name 5 November 1884 As of 5 November 1884,her married name was McKee. Mary Scott Harrison was born on 3 April 1858 at Indiana. She was the daughter of Benjamin Harrison and Caroline Lavinia Scott. 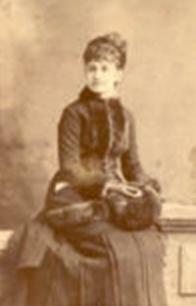 Mary Scott Harrison married James Robert McKee on 5 November 1884 at Indiana. Mary Scott Harrison died in 1930 at Connecticut. First Lady. Mary Scott Harrison McKee was the First Lady to her father, Benjamin Harrison, when her mother passed away. James Robert McKee was born on 9 December 1857 at Indiana. He married Mary Scott Harrison, daughter of Benjamin Harrison and Caroline Lavinia Scott, on 5 November 1884 at Indiana. James Robert McKee died on 21 October 1942 at Connecticut at age 84. Thomas Vesey was born in 1574. He was the son of Thomas Vesey and Elizabeth Church. Thomas Vesey married Ann Vere, daughter of John Vere, on 10 July 1598 at England. Thomas Vesey died after 1616. Married Name 1559 As of 1559,her married name was Vesey. Married Name 1559 As of 1559,her married name was Vezey. Married Name 1590 As of 1590,her married name was Harvey. Elizabeth Church was born circa 1547. She was the daughter of John Church and Rita Jean Tulloss. Elizabeth Church married Thomas Vesey, son of Thomas Vesey and Elizabeth Gardiner, in 1559 at Essex, England. Elizabeth Church married John Harvey in 1590. Elizabeth Church died after 18 March 1616. Name Variation Thomas Vesey was also known as Vezey. Thomas Vesey was born in 1536 at England. He was the son of Thomas Vesey and Elizabeth Gardiner. Thomas Vesey married Elizabeth Church, daughter of John Church and Rita Jean Tulloss, in 1559 at Essex, England. Thomas Vesey died in 1581. John Harvey was born in 1570 at England. He married Elizabeth Church, daughter of John Church and Rita Jean Tulloss, in 1590. John Harvey died in 1660 at England. Married Name 1608 As of 1608,her married name was Atherold. Mary Harvey was born in 1595. She was the daughter of John Harvey and Elizabeth Church. Mary Harvey married Thomas Atherold, son of Thomas Atherold and Mary Vesey, in 1608. Mary Harvey died in 1665. Thomas Atherold was born in 1564 at England. He married Mary Vesey, daughter of Thomas Vesey and Elizabeth Church, on 10 June 1610. Married Name 2 July 1638 As of 2 July 1638,her married name was Ball. Hannah Atherold was born in 1619. She was the daughter of Thomas Atherold and Mary Harvey. Hannah Atherold married William Ball on 2 July 1638 at England. Hannah Atherold died in 1695. William Ball was born in 1615 at England. He married Hannah Atherold, daughter of Thomas Atherold and Mary Harvey, on 2 July 1638 at England. Samuel Ball was born in 1648. He was the son of William Ball and Hannah Atherold. Samuel Ball died in 1689. Married Name Her married name was Hitchcock. Mary Ball married (?) Hitchcock. Mary Ball was born in 1673. She was the daughter of Samuel Ball. Mary Ball died in 1760. (?) Hitchcock married Mary Ball, daughter of Samuel Ball. John Hitchcock was born in 1692. He was the son of (?) Hitchcock and Mary Ball. John Hitchcock died in 1777. Married Name Her married name was Bliss. Miriam Hitchcock married Jedediah Bliss. Miriam Hitchcock was born in 1720. She was the daughter of John Hitchcock. Miriam Hitchcock died in 1793.